With the close of the window only around three weeks away and a massive personnel turnover already accrued at Ibrox, it does appear transfer business is reaching its slow-burning conclusion. With that in mind, here is a full round-up of all the current links, speculation, and deals in the Rangers' pipeline to see out the last month of the summer. This one refuses to go away. 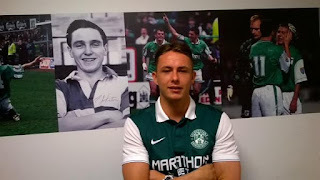 From rumours about disharmony in Hibs’ dressing-room over his steadfast desire to leave, to that slightly curious photo of the player pre-match at Dumbarton smiling uncomfortably in Hibs’ shirt in front of a regalia of Hibernian history (see above), the Scott Allan saga has overshadowed the whole window and appears no closer to completion. Alan Stubbs has put a £1M price tag on his head, but would be open to losing him for less – just not to Rangers. It has certainly affected Hibs on the pitch – a disastrous loss away to the Sons (the only player who actually showed up was Allan) does suggest the whole affair may come to a head sooner rather than later, but hopes are looking bleak that he will get his wish now. Rangers may have to wait till January. This one resurfaced yesterday with claims the Wednesday striker has already entered negotiations and will be a Rangers player come Friday. But this is 99% certainly false, and there is almost no chance May will come north, especially as the player himself wants to stay at the Owls. What a soap opera this is. Five weeks he has been at Murray Park now, going beyond the promised month it was proposed as. Warburton has said he has done very well and has progressed with the physios, joining full training, with a deal in the works, but as yet nothing has materialised and while clearly the manager wants him, the delay here is a mystery. This young pair are rumoured to be loan switches from White Hart Lane, but again, it has gone deathly quiet – various sources claimed this one had stepped up in pace, and was due to conclude by the end of this week, but only time will tell if that takes place. The good news is Rangers look in good shape presently, so while the above would enhance the squad, they are probably not as vital as they might once have been – but it is certain the window will have a few twists yet. I predict that of all the options above only the Stevie May one will not come to fruition........although the Scott Allan may take til January. Then again...my predictions are notoriously sh##e!!! £1 million? Rod Petrie can kiss ma grits. How can you be sure Stevie May move is 99% false? Because it hasn't Been mentioned in a single website or newspaper anywhere in Britain . Get back to yer Parkhead midden ya bam. Hibs could be 9 to 12 points behind Rangers a day or so before the transfer window closes. If that's the case, and Rangers offer 300,000, Hibs will sell, I predict. The Spurs boys will be going out on loan this season. If Rangers maintain their form, they might both come to Ibrox. Do we need to play them, if they do come? If so, I'd leave it. Use our current permanent squad, that's what the squad is for. These squad members will need games. So if we are still going strong during the next couple of weeks, I'd leave things as they are. Unless they bring in a couple more permanent signings. It would be a huge backdown, from Hibs, if the now sold Scott Allan during this window. However, if Rangers give Hibs another drubbing on 23rd of August that would leave them 6 points behind Rangers. Possibly, even 7 or 9 points, depending on this weekends results. That could prompt Hibs to do what seems very unlikely, at present, and sell to Rangers before the transfer window closes. Hibs will be aware that if Rangers are well in front, come the January window, then Rangers will not offer Hibs anything at all. They will sign the player on a pre-contract and take to Ibrox next season, for nothing. That would leave Hibs, in the second half of the season, depending, essentially, on a Rangers player to scupper Rangers and the player's own prospects of promotion. I feel for the player, but I think that Scott will do Hibs more damage if he remains where he is this season, than he would at Ibrox playing for Rangers. This issue could tear Hibs apart this season. Next season, for nothing, will suit Rangers fine, I think. Warburton s tactics then go and get turned over 4-0 at home against league 2 opposition. Some players & assistant managers never learn. Hope Dave king gets his wallet out next season but wouldn't bet on it. He'll do what's best for Rangers. As will the rest of the board. I believe the 2 Spurs lads have passed their medicals so fingers firmly crossed that they will be the business, I cant see another bid for SA until Jan so i think we should get him outta our heads & just get on with it.Unless as the previous chap says DK opens his wallet, I would love to get a good striker & i think that would do us & them maybe just maybe in Jan get anoter addittion for when we go up, Or am i getting carried away! Celtic in talks to sign Scott Allan, time to find out how big a Rangers supporter the boy is, be gutted if he goes to the mankies. If Celtic get Allan I'm gonna blame gers board for the derisery offers they made to hibs, it was a pathetic attempt to get him on board. I would not give Hibs a penny. I'd rather see Scott given half a million in four months. Love to see him at Ibrox. A prolific goal scorer is priority. My concern is if Waghorn got an injury? With a good run in cup games and high tempo attacking football a large squad will be needed. One more top class goal scorer should complete it for this season.MW probably has next years targets pencilled in and by January will know who is leaving. Exciting times.